Old Bone 1: There is a secret society of time travellers trying to set history "right" and a bad society working against them. But these time travellers are librarians (aka Lybrarians)! Who combine mad shelving skills with mad sword fighting skills! And who live in Petrarch's library where it's all a lovely geek and combat fest for both the residents and the reader, a place where books and scrolls are combined with swords and axes, and beautiful peaceful outdoor places and architecture of many times, and tasty snacks (which appear when magically "read" from books. (Not everyone can read snacks into material things; some can, for instance, make extinct auroches materialize). And the Lybrarians mission of setting things right is focused on the preservation of knowledge and valuable writings! They head back in time on dangerous missions to save books! Viz the bad society--they remain on the periphery for most of the book, which was fine with me because there was enough internal tension without dragging Good vs Evil into it. And after all, epic confrontations don't have to happen every day. Old Bone 2: two kids from our time stumble into the secret society and find out they are special. They make friends and enemies. An alpha girl hates the girl main character. The boy main character gets a crush on a pretty girl. Well, yes, Dorrie and her older brother Marcus do fall into a Magical World, and they are kind of special. They've opened a portal to our time, and are therefore the "keyhands" who can open it for others to travel through, and keyhands are a rather special type of librarian. --The library, as seen in this book, is rather focused on European civilization (I hope gets broadened in subsequent books), but there are Lybrarians and apprentices from places besides Europe, including Dorrie's new best friend Ebba, whose parents are from Mali, and who almost (but not quite) gets enough page time to be a main character. The whole set up of the library is just FUN as all get out, and the story zips along just beautifully. And though I kind of suspected a key plot twist, this in no way reduced my enjoyment. Best of all in my mind (given the number of books that I have put aside in the past month) I was never once kicked out of the story because of the writing. Which means that either the plot was so fun I didn't notice infelicities, or the writing was very good, or, quite possibly, both. I think this is my favorite middle grade fantasy of the year so far, and I look forward to more! Love that series title! I do like the idea that the kids are special, but not that special. Oh, yay. Love the idea of going back in time to save knowledge and books, although I worry how well I would fare at swordplay if called upon. I'm not that special, either. Just got this today from the public library, so may have to read bith this AND The Fury og the Seventh Son tonight! What fun. Sounds better than the magical library book I read last night where the library was kind of evil. This sounds SUPER exciting, Charlotte -- I KNOW what you mean about the umpty-nth book you've set aside because bleuuuch and ugh -- and finding, to your glee, that you're not only reading one ALL THE WAY THROUGH, but that it's made up of awesome with a side of amazing -- that's such a great feeling. And, I'm intrigued that there's a character from Mali there. Cool. This sounds like all kinds of fun, thanks for the great review. Hooray! 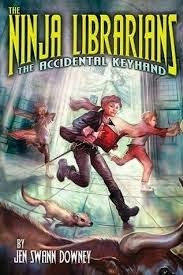 I love stories about magical librarians - I must put this on my reading list!